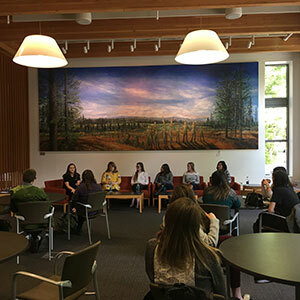 Alumna Ellen Yin shares what she’s learned as a 5 under 5 panelist. Ellen graduated in 2016 with a B.S. in Exercise and Sport Science and recently joined Samaritan Health Plans as a public relations and marketing coordinator. Prior to joining Samaritan, she worked in the fitness industry with a focus on social media management, influencer marketing and digital content creation. Ellen has worked with global brands such as Bodybuilding.com and the Miss Universe Organization and has garnered features in Glamour magazine, SELF.com, Shape.com, The Penny Hoarder and Her Campus. Synergies: How did being a student in the Exercise and Sport Science program prepare you for your current role? Ellen: “First, stop waiting for the right opportunity to find you – create your own. Months before graduation, I landed my first full-time, salaried job by pitching the position to the company’s CEO.